Soho, London. Kerri just got dumped by a rockstar who pioneered sounding like The Fall. Chaz watched someone die and wished he had his camera. Marie loves the movies, but she is never ever going back to The Electric Lighthouse Cinema. 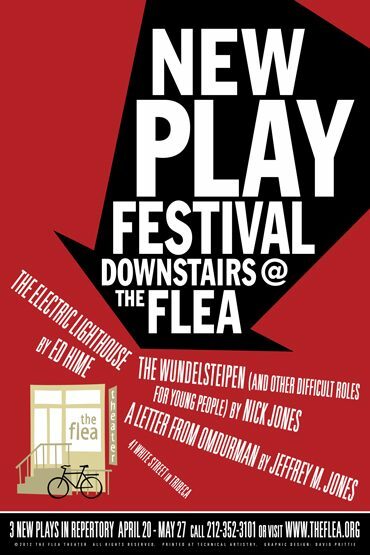 As part of the NEW PLAY FESTIVAL, The Flea Theater is proud to present the world premiere of THE ELECTRIC LIGHTHOUSE by Ed Hime and directed by Flea Resident Director Kristan Seemel. THE ELECTRIC LIGHTHOUSE is a jet-black comedy about trying to hang onto yourself in a city that wants to re-write you. The production features members of the Flea’s acclaimed resident acting ensemble, The Bats: Allison Buck, Jack Corcoran, Morgan Everitt, Andrew Fortman, Glenna Grant, Seth Moore, Margaret Odette, and Stephen Stout. The design team includes Kate Foster (Set), Jonathan Cottle (Lights), Colin Whitely (Sound), Lara de Bruijn (Costumes), and Michelle Foster (Stage Manager). Ed Hime was born in London in 1978. He was Writer in Residence at Hampstead Theatre in 2001. Previous theater credits include About the Boy (Royal Court Young Writers Festival) and London Falls/London Tongue (Old Red Lion) and Small Hours (Hampstead Theatre, Michael Frayn Space). In 2007 he was the Royal Shakespeare Company’s nominee for The 50, a Royal Court/BBC talent-nurturing venture, and recently completed an attachment at the National Theatre Studio. Television credits include Skins series 4 and 5 (for which he was nominated for BAFTA Craft Breakthrough Talent in 2010). Kristan Seemel (Flea Resident Director) worked for eight seasons at Portland Center Stage, first as a Literary Associate and later as Corporate Development Associate during the organization’s transition into the historic Armory Theater, a world-renowned Green Building project. He’s directed the premieres of Mutt by Lava Alapai (Many Hats Collective) and The Verspiary by Matthew Zrebski (Stark Raving Theatre) as well as NW regional premieres of Carlos Murillo’s Mimesophobia (Sand & Glass Productions), The Long Christmas Ride Home by Paula Vogel (TheatreVertigo) and Mac Wellman’s A Murder of Crows (defunkt theatre). Kristan is a recent graduate of the Brown/Trinity Rep MFA program in directing and while in Providence he helmed workshop productions Oh Guru Guru Guru by Mallery Avidon and The Darkson Chronicles by Theo Goodell. Other credits include: Brecht & Weill’s The Threepenny Opera, John Webster’s The Duchess of Malfi (Brown/Trinity Rep) and Hamlet (CoHo Productions). Kristan’s staging of Gertrude Stein’s Doctor Faustus Lights the Lights garnered him a Portland Dramatic Critics Circle award (Drammy) for Outstanding Direction. Some of his assisting credits include A Raisin in the Sun, A Christmas Carol and Camelot (Trinity Rep).